Florida is a year round destination with something for the whole family. and world the world’s best amusement parks. What are waiting for? The “Venice of America” is lined with canals and yachts. But there are also miles of sun drenched beaches, water-sports galore and plenty of family entertainment. The Everglades are close by with miles of wildlife and nature. Take a tour on a air-boat ride. Go golfing, diving, sailing .. it is all here for you. This area is at the center of the great beaches of the southwest Gulf coast. 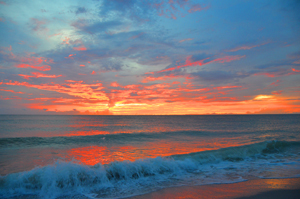 Outdoor adventure awaits you with world class beaches, fishing, dolphins, manatees, golfing and more. The last island on the overseas highway and the Southernmost Point in the continental USA. It is the land of Margarita’s, Jimmy Buffet, sunsets and the Caribbean life. Here you can dress in flip flops and swim suits by day, and in the evening enjoy one of the most stunning sunsets in the world, followed by great food and dancing. 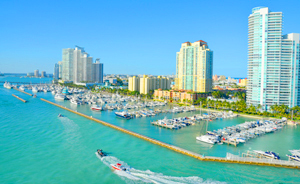 Considered the “Gateway to the Caribbean”, Miami is a busy cruise port, but it offers so much more. 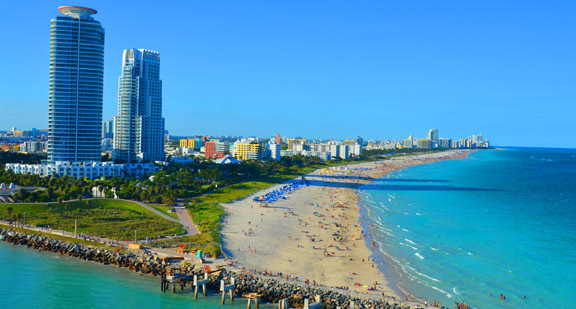 Yachts, stunning homes, Deco Drive, and of course beautiful beaches. For sports enthusiasts there is the Miami Dolphins, Heat, Marlins and Panthers. You can enjoy a little golf and fishing too. 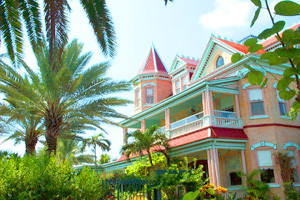 At the edge of the Florida Keys and the Everglades nature is at the doorstep. 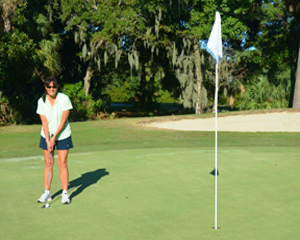 With over 80+ championship golf courses, Naples is considered by some as the “Golfing Capital of the World”. Miles of beaches, spectacular sunsets, great shopping, sumptuous dining, art galleries and theater … well just about everything you could want in a small upscale city. One of the world’s top destinations for families. 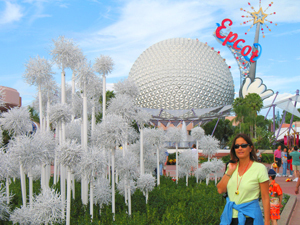 With so many theme parks including Disney World and Universal Studios, there is plenty do for all ages. Combined with golf and plenty of sunshine, this city will keep you coming back for more. The Suncoast of Florida doesn’t just have great beaches and the Gulf of Mexico; there is also art, theater and a host of interesting activities. 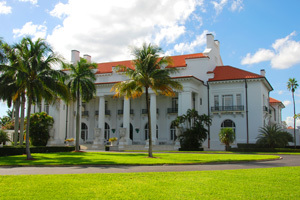 The Ringling estate features the State Art Museum of Florida with an amazing Rubens collection, the Venetian mansion and Circus Museum. The Mote Marine Laboratory & Aquarium center does ground-breaking research. The theater and arts scene reviles bigger cities with the Van Wezel Center, Sarasota Symphony, Opera and ballet. 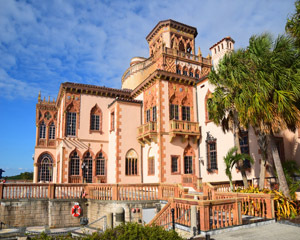 Considered the first vacation playground in Florida opened up by the legendary Henry Flagler, this area has miles of beaches from Boca Raton to Jupiter. Luxury homes, condos overlooking the blue Atlantic Ocean and extensive entertainment for the whole family. What more could you ask for? Over 30 miles of sugar sand beach on the Gulf of Mexico make this area one of the most popular in Florida. 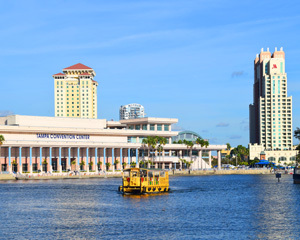 Highlights include the Dali Museum, dolphin cruises, Clearwater Marine Aquarium, Fort De Soto, Mahaffey Theater, watersports and more are all waiting for you. This city on the bay is a year-round family destination. Theme parks like Busch Garden and Adventure Island, The Florida Aquarium, Lowry Park Zoo, Ybor City, Museums, beaches and so much more. Whether you ride the street car or ride bikes along the water front, this is a great city to explore. Culture, wildlife, history; it’s all here.